Given that consistent innovation and development are behind the growth of any company, the communication of ideas and information is essential. From concept to design, there are numerous ways of conveying those groundbreaking projects and new products. One effective method is using a PowerPoint presentation. Microsoft PowerPoint has become a standard tool for preparing and presenting business ideas and information. That’s why .PPT or, more commonly, .PPTX is the most used format for putting together slideshows. However, most presenters convert their finalized PowerPoint presentations to Portable Document Format – PDF. When used in conjunction with the PDF format, the advantages of using PowerPoint multiply. The most important advantage for the presenter is the ability to use both formats for constructing, sharing, and displaying their PowerPoint presentation more efficiently. Creating a high quality presentation involves a lot of time spent in information and research, planning and editing. The process of putting together a PowerPoint slideshow can sometimes be described as follows. As soon as you have your presentation topic, you’ll need to start with research and data gathering. If your slideshow is to be based on one or several of recently created documents (for example, budget plans and projections, project proposals, analysis reports), then you don’t have to start from scratch. In this case, information and materials are already researched and prepared. With MS PowerPoint and its robust capabilities, presenters can populate their presentations with all sorts of content and can insert all sorts of other formats into .pptx files. For example, you can embed video and insert PDF and audio files with virtually a click of the mouse. Or, you can insert an entire Adobe Acrobat document into your presentation as an object. The possibilities for creating rich presentations are almost endless, especially if you take into account numerous ready-made templates, animations, transitions and all sorts of effects for capturing the attention of your audience. But what if you already have some great, archived PDF presentations that you would simply love to reuse in PowerPoint and enrich with some new data or simply use as a starting point for your newest slideshow? The most obvious answer is that you can copy-paste that content from PDF into PowerPoint. If you’ve ever done this before, then you know that toggling between documents can be both time consuming and tiresome. Is there an easier way? Yes, there is – a PDF to PowerPoint conversion. To convert PDF to PowerPoint, you need a PDF conversion software solution. If you’re a professional presenter looking for high quality conversion results, make sure to try free the latest version of Able2Extract Professional. If you’re worrying whether it’s compatible with your operating system, you’ll be relieved to know that this desktop PDF suite is cross-platform compatible. It runs on Windows, Mac OS X and Linux (Ubuntu and Fedora). Selecting content for conversion to PowerPoint. You can choose to convert entire presentations, individual slides, a slide range or only a part of one slide. Converting the content by clicking the PowerPoint button on the main toolbar. Before starting the conversion, Able2Extract Professional will offer you to specify the location on your hard drive where you want the file to be saved. Following the conversion, you can start editing your PowerPoint presentation without the tedious copy-pasting and toggling between documents. With Microsoft PowerPoint, you can create persuasive and winning presentations. 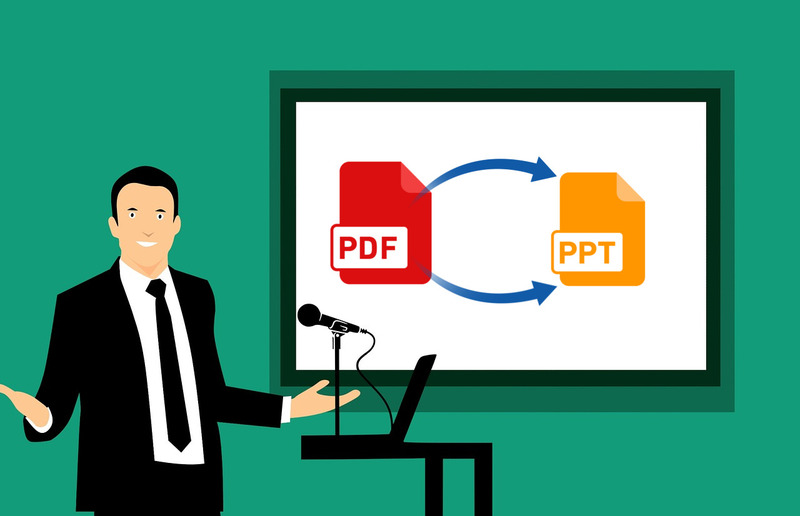 With Able2Extract Professional, you can quickly transfer non-editable slides from PDF to PowerPoint and build your presentations in a more efficient and productive way. Download Able2Extract Professional for free and see for yourself how it contributes to your presentation needs.